Progress with the brewery has been a bit slow this past week, and will probably be slow until early next week. I’ve taken a short project with my “day job” to help pay some bills, and to make sure we can keep paying the rent on our building. It’s a bummer to have to slow things down a bit, but until we get all of our financing lined up, I’ll have to fall back to the day job from time to time to keep everything from coming to a complete stop. And, to look on the bright side, I’m grateful to have the flexibility to be able to do that sort of thing. Anyway, despite last week being slow, here is something that I was able to work on a bit. 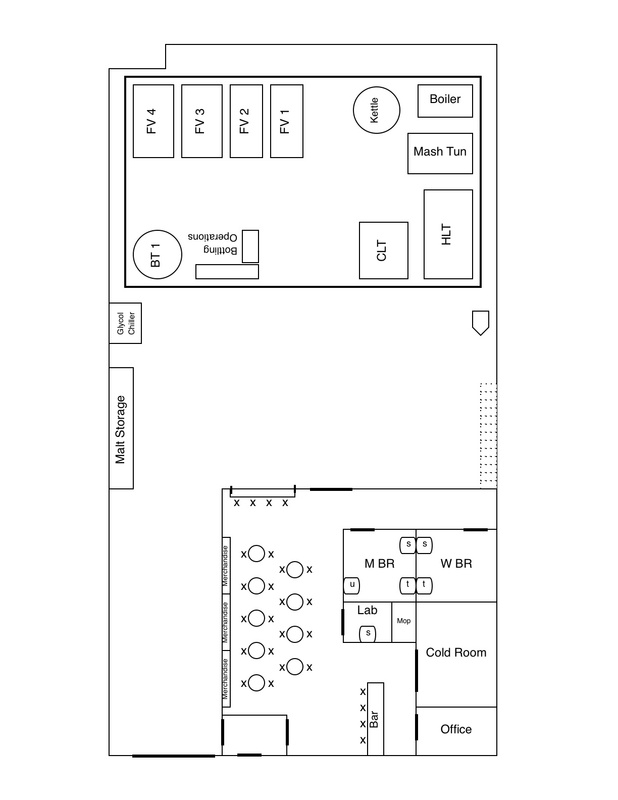 It’s kind of hard to tell in this drawing, but in the upper left corner of the tap-room, there is a big window that looks out onto the brewhouse floor. In front of this window there will be a small wall-table (wall-bar? ), so people can enjoy a beer while checking out the view of the brewhouse. This entry was posted in Uncategorized and tagged Business Startup, Craft Beer, Eagle Rock Brewery, Microbrewery. Bookmark the permalink. Awesome stuff guys! I wish you nothing but the best of luck!